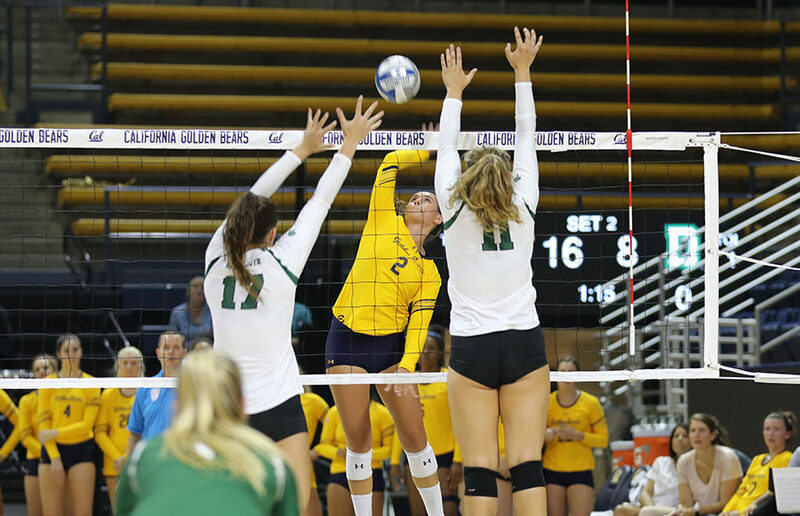 Like most good things, the Cal volleyball team’s winning streak came to an end Saturday against Pacific. The Bears followed their season-opener loss to UC Irvine with consecutive wins. On Sept. 15, the team won its 9th game in a row against Saint Mary’s in a 3-1 home match. The next day, though, when the Bears played at the Tigers’ home court, they lost 2-3. The Bears and the Gaels started the match in a close battle. At the first timeout of the set, called by Saint Mary’s, Cal had the lead at 14-10. As the set progressed, the Bears found themselves tied 20-20 and eventually lost the set 23-25, struggling to put the ball away. “The first game, (Saint Mary’s) got some momentum at the end of the game and ended up winning that game,” said head coach Matt McShane. Though they lost the first set, the Bears executed, most notably at the net, in the following three sets. Indeed, in the second and third sets of the game, Cal’s overall kill percentage significantly increased from the first, while Saint Mary’s fell slightly. Senior Christine Alftin and freshman Preslie Anderson led the team with 0.444 and 0.455 kill percentages, respectively. Freshman Mima Mirkovic, an outside hitter, also served as an important player in the game, with 39 attack attempts and a 0.256 kill percentage. Though the Bears had an early lead often of six to seven points, each set was decided by four or fewer points, as they won the final three sets 25-22, 25-21 and 25-23. While spirits were high for Cal on Friday night, McShane noted that the players planned to focus on being more consistent in their next day’s match against Pacific. “This was one of our more inconsistent matches,” Gaffney said. After dominating in the first set with strong hitting and passing, the Bears let up as the Tigers fought their way back into the game. The following three sets were much tighter than the first, all decided within four points in a similar manner to Cal’s match against Saint Mary’s. Pacific took two of those next three sets to tie the schools up at two apiece. The tiebreaker set lacked the nail-biting nature of the previous sets as the Tigers easily handled the Bears 7-15, scoring kills in eight of their ten attempts with no errors. Despite the loss to Pacific, Cal’s record is still much stronger than the past few seasons’ records. The last two years, the Bears only won a total of nine games, a feat the 2017 team has already matched. Both McShane and Gaffney attribute much of this team’s success to its offense. Gaffney noted that Mirkovic, in particular, has proven to be a valuable asset as an outside hitter but also noticed the team’s strong chemistry.